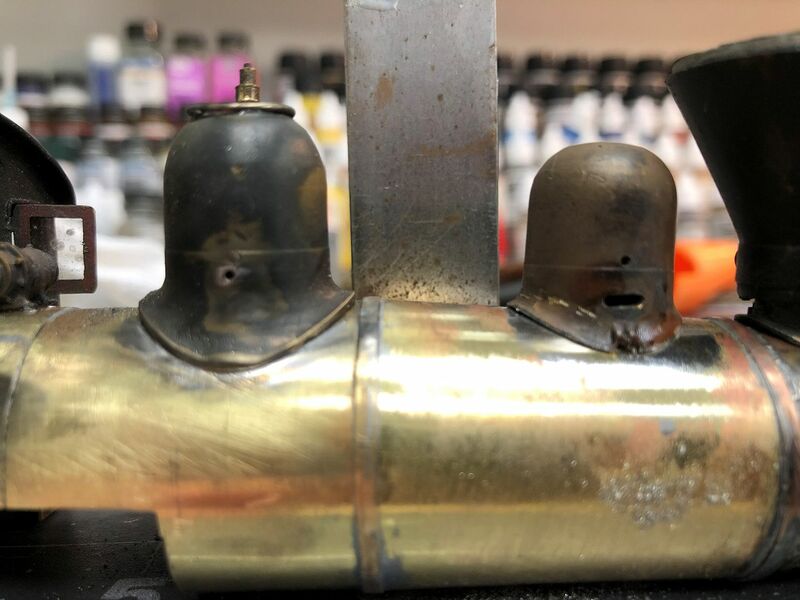 What are you using to primer brass? First thing I do with all Brass is to soak it in a container of Lacquer thinner to strip the clear coat and remove oil and grease. just make sure there is no plastic parts (like insulators) or you could have a mess. then I let them dry really good and use a Badger Air eraser to sand blast them. sand blast in a box to catch and reuse most of the media. Then I blow them off good and wash them in hot soapy water, make sure to get all the media out and they are dust free. 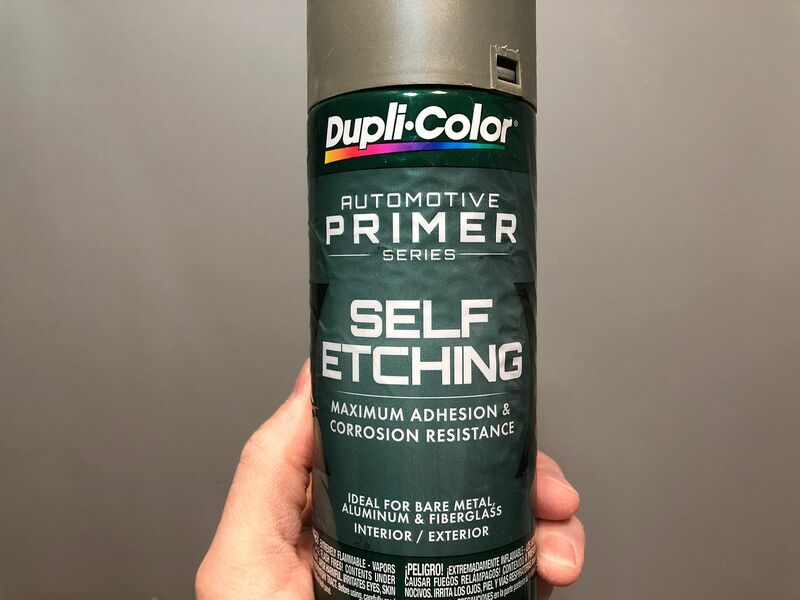 normally at this point I would just airbrush on acrylic black paint, which has always worked well for me and is very tough, however this time I tried something new and sprayed (from a can) automotive etching primer, the brand I like is Dubli-color (sold at auto parts stores). I sprayed it with several light passes at all different angles. 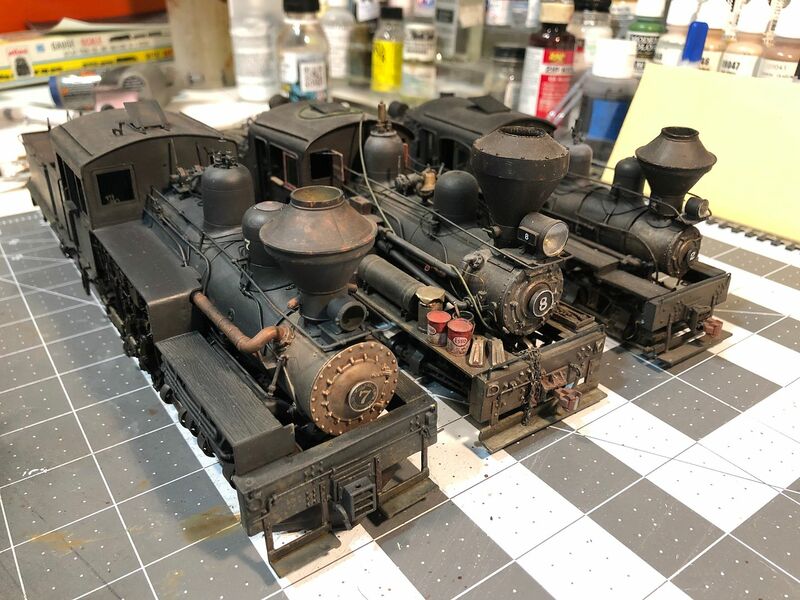 after the primer dried for a day or two (or more since I don't have much free time right now) I sprayed on Polly Scale steam power black, thinned with a little model master acrylic thinner. After the black I sprayed model master acrylic clear gloss (looks milky in the bottle but dries clear). Then I decaled the model, using Walthers solvaset to settle all the decals, and from a can used testors dull coat (lots of light coats). I will never stress enough the need to gloss coat before decals. Also, even if the decals are on a smooth surface (no ribs or rivets) you still have to use a settling solvent to push out the air that creates the silver looking spots in the decal film. To me there is no greater dull coat then the plain old Testors dull coat, either from a spray can or from an airbrush, dries fast and smooth and hides the decal film perfect. use only a new can on models, when a can gets old and splattery use it on scenery (like rock castings painted with acrylic paint). 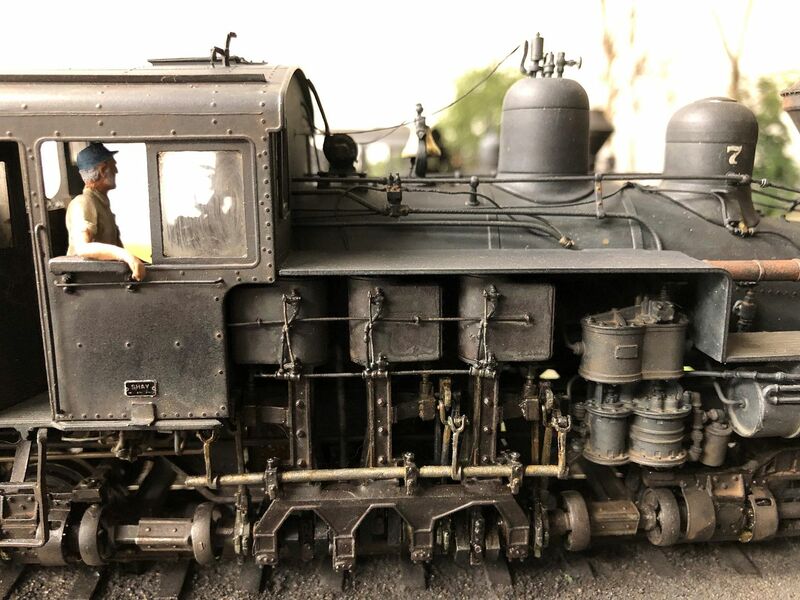 One of the best kept secrets from model railroaders are military modelers. if you are not looking at military dioramas and models you are missing out on some of the best products. 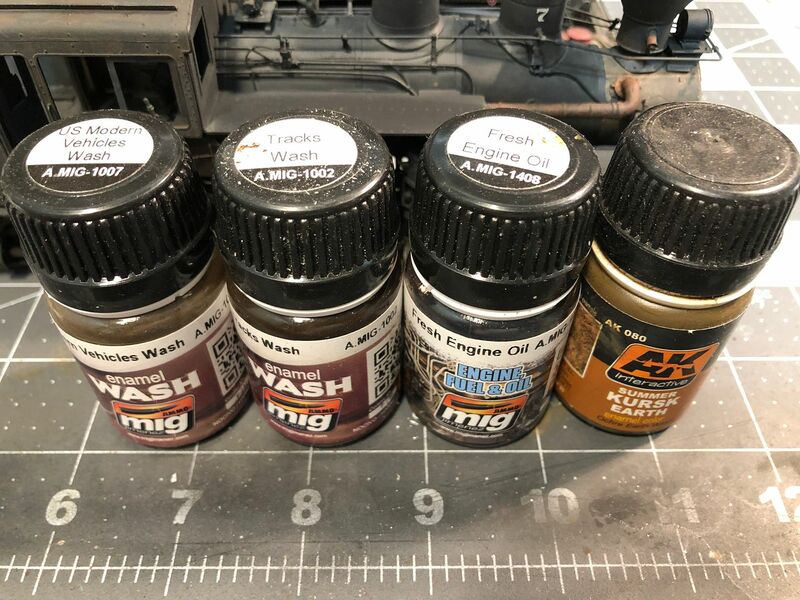 one such product are the AK interactive and Mig weathering washes, they are magic in a bottle. The washes are premixed to be a wash, so there is no guessing to the mix, which means you can be more predictable with the results. they are oil based, which means they dry a little slower and they don't bead on surfaces like acrylic can. Also, to a point you can rework them as long as you don't let them dry too long. The slow drying of the washes mean that it does take several nights to build up the final look, but the slow dry process means that you can blend better and rework it better than acrylic. normally I do one color wash a night, and it only takes a few minutes to apply the wash so it is something I can do when I only have a few minutes in a day. For this shay I started with a wash of Modern Vehicle washed. I just got a big soft brush and brushed it on everything. I went back with a damp brush to pick up the puddles along the bottom. I also went back after a few minutes with a brush of damp mineral spirits to wash some away from the big surfaces and blend it into the details. I would error on a thinner wash and just do two or three coats over a few days until you're comfortable with the results. The washes look bad until they dry. The modern Vehicle wash will give that sun bleached black look, which is what you need to weather black. Black is the hardest color to weather because you cant "shadow" black. If the model is black and the shadows are black the locomotive looses all detail and just looks black. the wash is a grayish color and it really looks like sun bleached black. After the wash dries then you can add grime and rust and it will actually show up, and the details will pop back out. on this model I wanted the look of an old white strip job around the tenders. I decaled on strips and after they dried (before the dull coat) I took a brush and stippled the steam power black over the strips to look like they are chipped and fading, then I dull coated. you'll also notice that I did not add a name yet to the model, I'll show why in the future. After the vehicle wash I used a color called Track Wash. All the trucks and the frame (except for the top surfaces) were brushed on with track wash. a very think coat of track wash was applied to the top surfaces of the cab and tender and a little on the sides to look like dirt. the track wash is a rusty color and it makes the black get that rust film look that you can see on black painted parts. other washes I used were Engine oil, which I painted around the rods and truck gears. Engine oil gets this wet oil color when it dries. on the rods it looks like parts that are wet from steam. on the firebox the mix of engine oil over track wash gets that hot fire box look with steam and oil all over the surface. I also used some Mud wash that I flick with a paint brush onto the trucks, frame bottom, and pilots. I still have a ways to go but here it is so far. all of this was applied over several nights, working just minutes at a time. Btw, I am still going to post some of the R&S HO stuff here, just give me some time. some of it got damaged, some is just too fragile to ship. 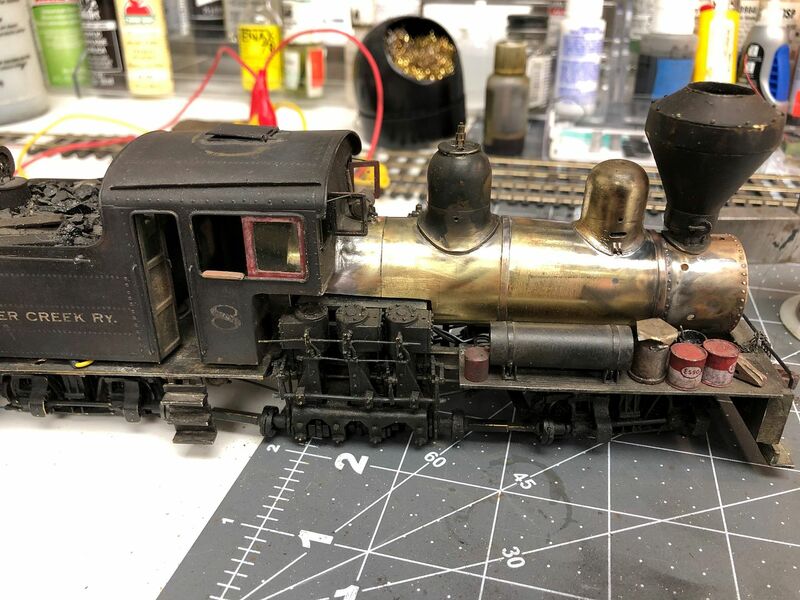 I had a person from this forum purchase most of the rolling stock almost 10 years ago, but there are a few pieces left that he did not want that I will post. there are a few locomotives but I want to test them out because it has been a long time since they ran. 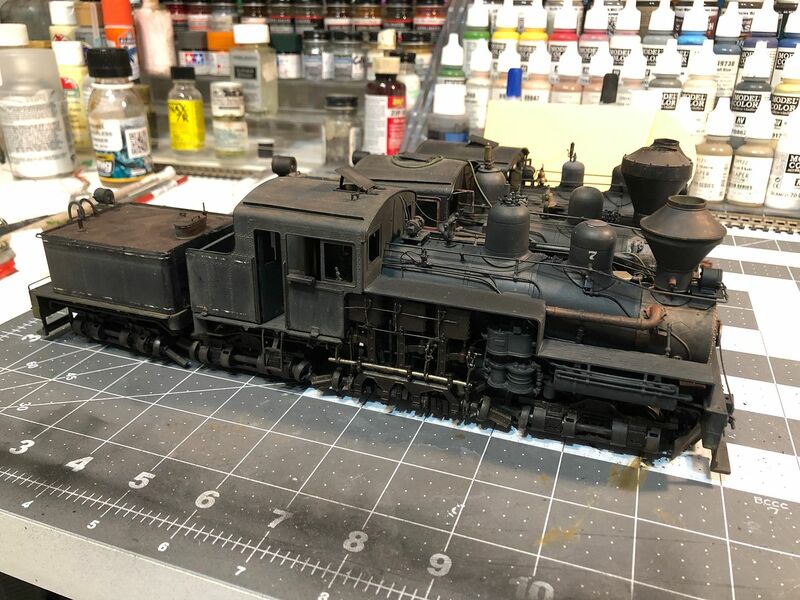 Good info on painting your locos. Thanks for posting. Excellent painting. You got a great looking fleet there. Did the boiler itself get anything special? That�s beautiful work. The impressive lineup conveys a sense of power and looks very real. Ah (facepalm) I was looking for AK stuff not MIG. I have the AK set for weathered wood and they are great. Coal Train thank you for your excellent instructions on your painting methods. 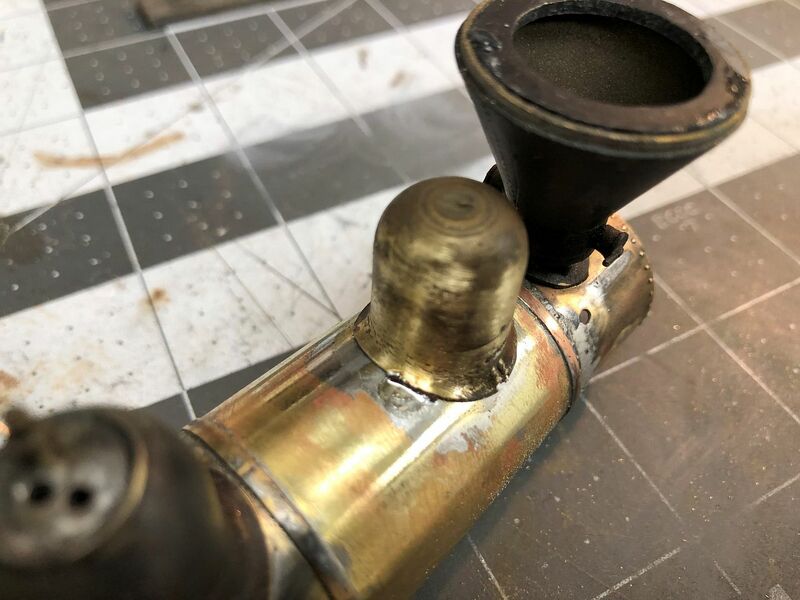 Like you I strip and sand blast my brass, however after they are clean and ready for paint I used to use Floquil Zink Chromate primer, however we lost my stash of Floquil and our house due to the Tubbs fire in Sonoma County last year, thus my inquiry as to what primer you employed on your brass. I am in a constant fight with acrylics and would prefer to use lacquer or enamel based paints. I was considering using Nason�s auto primer, but will attempt to purchase your recommended auto primer for experimentation purposes. Besides MIG /AK weathering tools I also employ Wilder products. Thanks again from your locomotive painting process and I look forward to seeing more of your excellent craftsmanship. 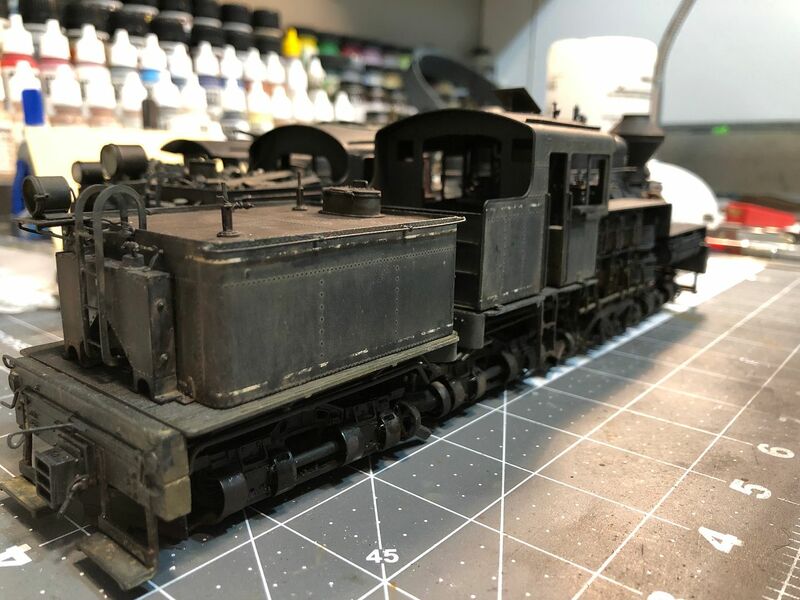 here is the primer I used for this locomotive. things got busy at work and I had two weeks of jury duty, however I finally unpacked all the old R&S stuff, unfortunately most did not survive 10 years in a hot and humid attic. at the time I built the R&S I was big into scratch building in styrene and most the structures were built entirely from styrene. the only R&S structures not built from styrene was the large coaling dock (my first time working in wood) and a few of the road bridges. At the time my basement was a very consistent climate and I did not brace most structures well, other than a few triangles of styrene to keep the corners square. may of the structures warped pretty bad while in storage. not all were lost though, a few of them that I did build well, like the Derby company store and the Roda store did survive. A local modeler that is also doing an Appalachia based layout took most of the structures to either salvage or repair them. the ones that can be fixed may end up on his layout or I may get them back as payment for the ones he keeps. I don't want to devote any more time to them as my modeling time is very limited and all the time I do have I want to spend on my On3 stuff. and speaking of On3, while I was un jury duty I did get a couple days to not only work on the R&S stuff but also to make some Shay progress...and some Shay anti-progress (more on that later). Shay progress was on the big Shay #7. 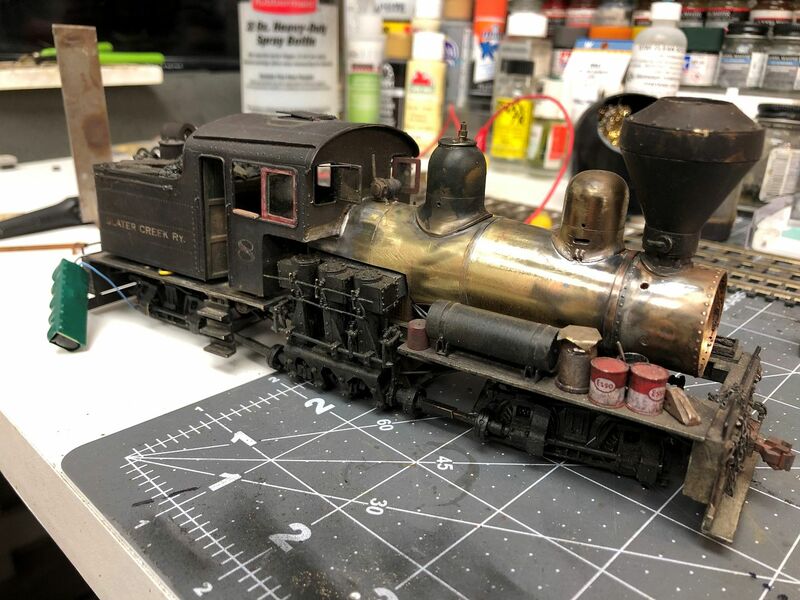 I got to do a little more detailing and weathering on #7. it is mostly complete with decoder installed. for this shay I used a Loksound V4.0 decoder with a Tang Bang speaker. I learned about Tang Bang speakers on David Stewart's A&O forum, and if you want to know more about them go there and read the Tang Bang Post, there is a ton of information on them there. http://forum.aorailroad.com/t/tang-band-speakers/312/17 . the speaker is big but I had the room in this big shay's boiler, the sound is pretty glorious, I will have to post a video of it. I used a Lokprogrammer to adjust the decoder sounds, which caused me lots of trouble that I finally traced to the TCS keep alive that I added. For anyone trying to program a Loksound decoder with a keep alive pack, you must disconnect the keep alive for the programming to work correctly. I soldered a mini plug to one of the wires to the keep alive pack and unplug it for programming. Also, Loksound decoders come with CV113 set very low and for the keep alive to work good I suggest you set CV113 to 255. CV113 controls how long the keep alive will keep the decoder going after it power loss. I still have a little work to do to #7, some more program tuning and some more tuning. I am trying to find the "happy" chain tension setting for it to run good, there is a slight vibration in the chain that I can't seem to get adjusted out, I will keep working at it and see what I can do, for now it is ok because the vibration only seems to happen at high speeds, but since this is the road engine I know that it will get run wide open on its run from the dump trestle to the load tipple. BTW, wide open is still slow. one reason I wanted to make sure I faded the black paint is to show off the fresh black patch out of the former owners name on the tender. I got the idea to patch out the name from the book "trackside West Virginia", in that book was a photo of a 3 truck shay that was patched out and a Georgia Pacific logo placed on the patch. I was going to put on some SCRy letters on the patch but I felt that my RR would not have even gone through that trouble because this locomotive was fresh on the roster in the period I am modeling. and now for the anti-progress. one thing that always bothered me was the look of the boiler on my #8 shay. 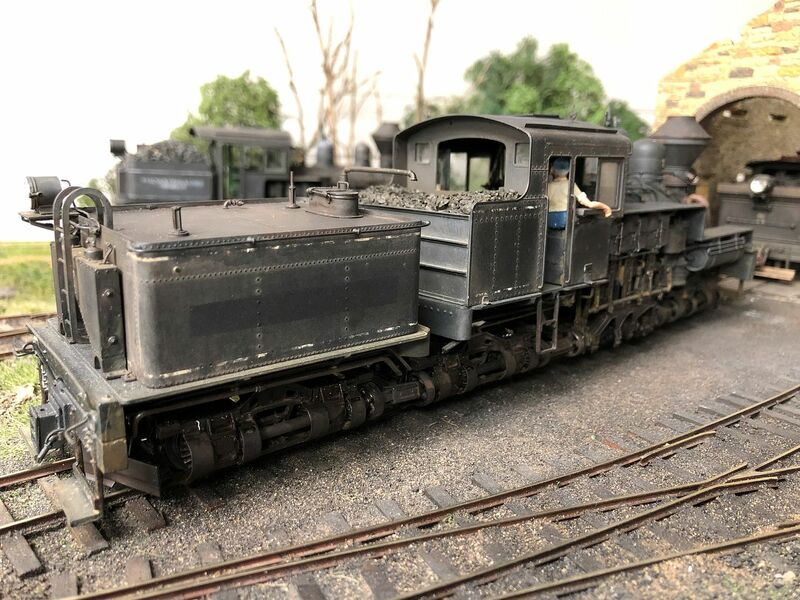 When I built the cab for *8 I did not know all that much about shays, and now that I know more than I did then I now know that the boiler is too old of a design to have a cab that is "modern". 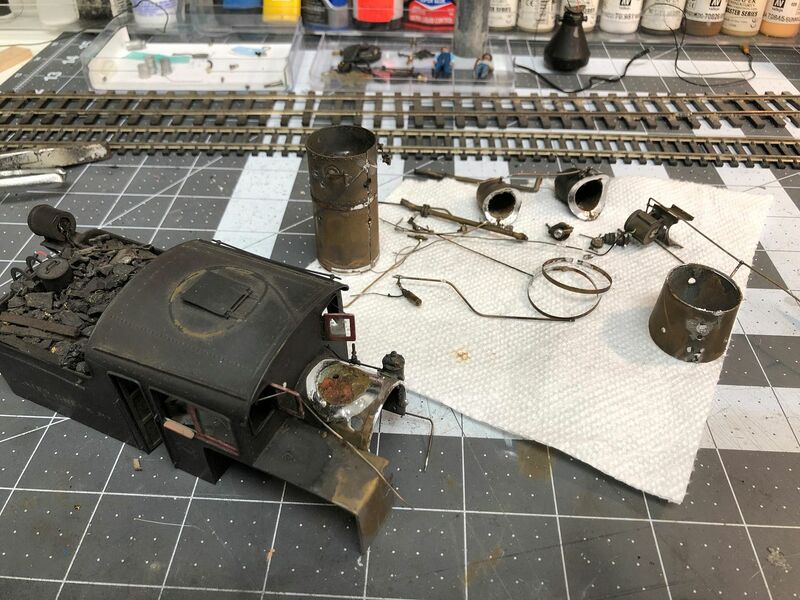 It could be that the original cab was destroyed and a new metal cab built, however what would look better is to build a new boiler that is more current to match the design of the cab, so that is what I am doing. 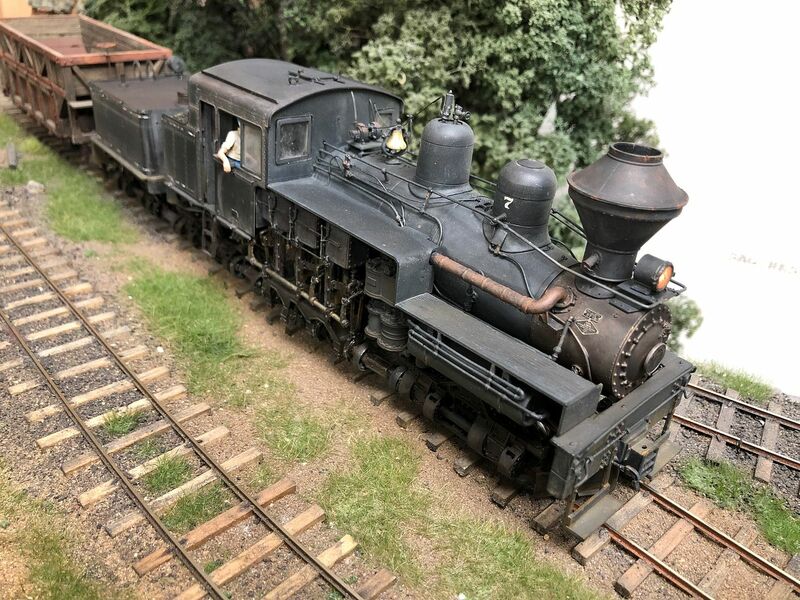 At first I was just going to try and move the tapered section forward so it was right behind the smoke box, however the section was too short and the larger diameter section that was left was not large enough. 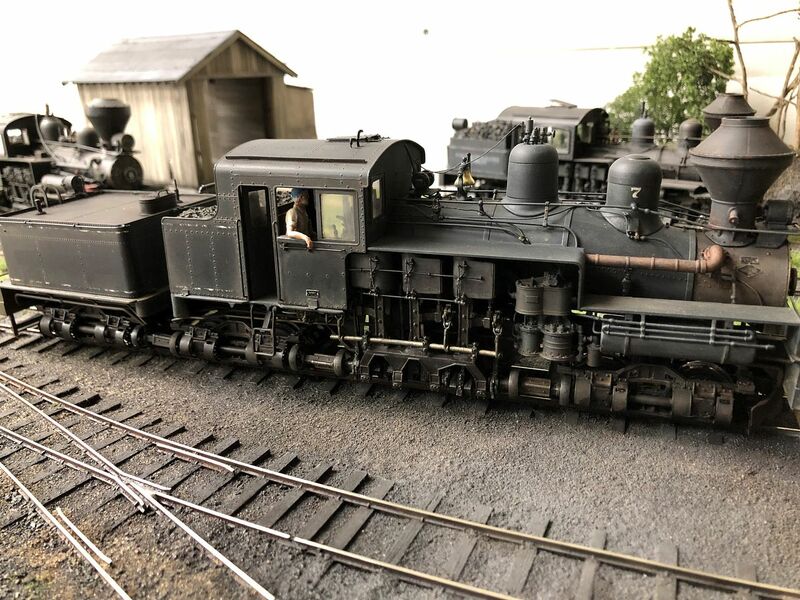 I ended up cutting out all of the boiler and building a new one from the smoke box back, which required lots of hacking to the cab to get it to fit. so far just got the boiler built and mounted, steam domes mounted, and air pump and generator mounted. there will be lots of plumbing to modify and add yet. so far I am glad I made the change, it makes the locomotive look a little more beefy than that old skinny boiler. one issue with the new boiler is that the sand dome was once mounted on a straight boiler and now it had to be on a tapered section. to change the dome I took a Dremel tool and thinned out the dome so I could bend the bottom flare. it took a lot of grinding and testing until I was able to get it to bend. it is very easy to get a dome that looks vertical but ends up actually to be leaning. I used a machine square and my cell phone camera to check it as I went. the reason I use the camera is that your eye will lie to you and photos are a better check. if you want to see flaws in your model just take a photo and blow it up on your computer, yikes. however for this I was just taking photos on the camera and looking on my phone. here is an example of a dome that looked vertical to my eye but you can see in the cameral that it is leaning forward. after a little more bending and fitting I soldered the dome in place. Domes are really hard to do and if you can just screw them on do it, that way you can adjust them. these domes were hollow and I did not go through the trouble of soldering in a plate that would have let me screw them on, never again. Anyways, here is how I do soldered on domes. I first just tack solder one spot of the dome. the reason for the tack solder is that it is much easier to heat only one little spot to remove the dome that to try and heat the entire dome, risking unsoldering everything else around it. after I tack solder the dome I check it, if it is good I will start another tack 180 degrees from the first tack. the dome is a big heat sink and you will not soften the first tack. check again and if all is good start soldering from the second tack toward the first, as you work the solder will solidify as you move away from the starting point, however by the time you reach the first tack I stop and let it cool for just a few minutes. 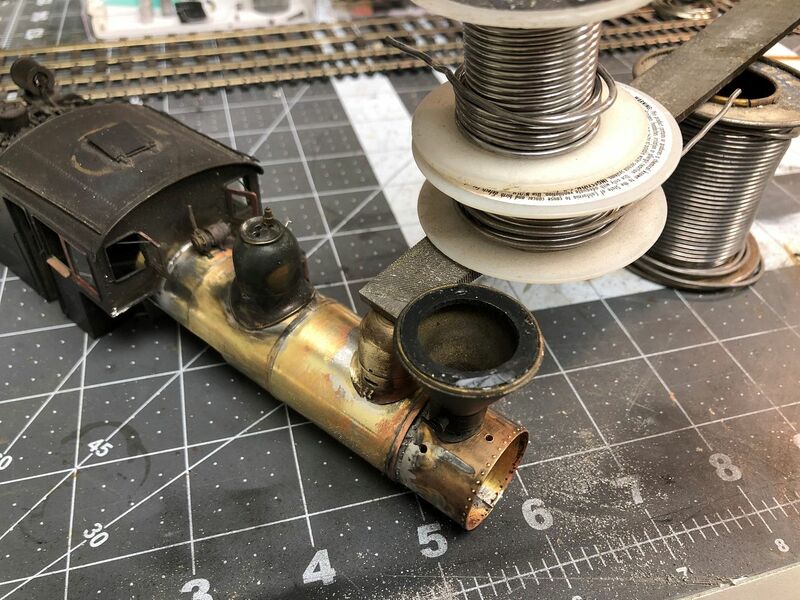 the biggest trick to soldering brass models is to learn to control heat, you want to keep heat in the brass to be able to work fast but not too much that the heat travels faster than you can work. to get the first tack started I first had to position the done and hold it there so I had two hands free to work the iron and the solder, here is how I clamped it while I checked it and did the tack. I get a lot of request to do some videos on my brass work. I have some other brass projects in the works and I will do some videos then. Your room turned out nice I'm doing my basement right now....hope to have it done this summer. HAven't been on the forum for some time. I think last time i checked in you were back around page 40. A bit to catch up on. I jumped back in at the right time to see the loco painting info. Heading down this track myself after painting a few odd hon3 locos im looking to repaint entire ho fleet and some new additions PSC shays and things. I have one question though on your process. It looks like you have painted the whole truck and not masked anything like the gears ect? Even the cylinders? Do you go back and clean the wheels up ect? Appreciate your comments on the above.